The GW Hatchet has an update today on the death of Brian Adkins, a Foreign Service Officer who was on his first diplomatic assignment in Addis Ababa, Ethiopia. “An Ethiopian man has pleaded guilty to the murder of 2007 alumnus Brian Adkins, a Foreign Service officer found dead in his Ethiopia home this February, according to Adkins’ family. State Department officials told family members that a man named “Sammy” had admitted to beating Adkins to death with a baseball bat in the Ohio native’s African home. Sammy, a local man whose full name was not available, had met Adkins through mutual friends who frequently played video games at the house. The White House recently sent to the Congress a supplemental appropriations request totaling $83.4 billion that will fund our ongoing military, diplomatic, and intelligence operations. The State details are excerpted below. Read the whole thing here. For an additional amount for “Diplomatic and Consular Programs”, $594,315,000, to remain available until September 30, 2010, of which $117,983,000 is for worldwide security protection and shall remain available until expended: Provided, That the Secretary of State may transfer up to $137,600,000 of the total funds made available under this heading to any other appropriation of any department or agency of the United States, upon the concurrence of the head of such department or agency, to support operations in and assistance for Afghanistan and to carry out the provisions of the Foreign Assistance Act of 1961. This proposal would provide $594.3 million for Diplomatic and Consular Programs as follows: $150 million for the U.S. Mission in Iraq to meet the increased costs of security and operations; $363 million for the U.S. Mission in Afghanistan for increased staffing levels, support operations, and security programs throughout the provinces and in Kabul; $52.9 million for operating and security costs for the U.S. mission in Pakistan; and $28.4 million to support additional counterterrorism and diplomatic operating costs for the Department of State. For an additional amount for “Office of Inspector General”, $7,201,000, to remain available until September 30, 2010, which shall be transferred to the Special Inspector General for Afghanistan Reconstruction for reconstruction oversight. This proposal would provide $7.2 million to the Special Inspector General for Afghanistan Reconstruction (SIGAR) to support SIGAR’s authorized responsibilities. For an additional amount for “Embassy Security, Construction, and Maintenance”, $898,728,000, to remain available until expended, for worldwide security upgrades, acquisition, and construction as authorized. 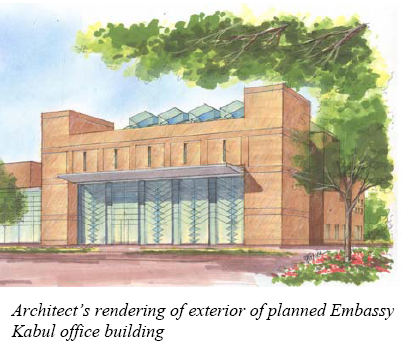 This proposal would provide a total of $898.7 million for Embassy Security, Construction, and Maintenance. Of this amount, $893.2 million is provided to meet secure diplomatic facility and housing needs for U.S. Mission staff in Afghanistan and Pakistan, including $87.0 million to acquire additional property to support expanded diplomatic facilities in Kabul, Afghanistan; and $806.2 million to construct new secure and safe facilities in Pakistan, including construction of a new U.S. embassy building in Islamabad and other secure diplomatic facility needs in Pakistan. Of the $806.2 million for Pakistan, $736.5 million would fund a major upgrade of facilities in Islamabad to meet security and building infrastructure needs. This includes: $111 million for the construction in Islamabad of a new annex to accommodate approximately 330 personnel; $405 million for the renovation or replacement of the existing chancery to accommodate approximately 645 personnel; $108 million for permanent New Embassy Compound (NEC) housing (156 units); $112.5 million for construction of U.S. Marine Corps security guard quarters, and general office facilities. In addition, $29.6 million would support site acquisition for future construction of new consulate facilities in Lahore, and $40.1 million would support diplomatic facilities in Peshawar. This request would also provide $5.5 million to deploy mobile mail screening units to protect U.S. Government employees at various high risk facilities. Approximately 73 mail screening units will be deployed to posts worldwide based on threat level (as determined by the Department of State’s Bureau of Diplomatic Security). This is an unanticipated need based upon security threats directed at many individual embassies and consulates worldwide. “In the nearly eight years since the 9/11 attacks, the foreign policy of the United States has often appeared to be an exclusively military affair, if not always conducted by men with guns then practiced by civilians not shy in reminding their foes that they had force at their disposal. The diplomats, for the most part, watched from afar.